It has been almost two years since Althea Winslow was widowed, and the tiny Ozark town of Marrying Stone, Arkansas, has decided that it is time for Althea to remarry. She can’t farm the fertile land that she has inherited, and leaving “the best corn bottom” in the area fallow goes against the values of the agricultural community. Everyone is also agreed that Althea’s three-year-old son needs a father, and a young, healthy woman like Althea needs a man and more children. Althea’s interfering mother-in-law, who wants to ensure that the land remain in the hands of the McNees (the family to which she and Althea belong by birth), insists that Eben Baxley, a lazy young man partial to drink and pretty women and cousin to Althea’s late husband, is the best choice. The owner of the general store pushes his son, Oather Phillips, to marry Althea. Althea, whose father remarried after her mother’s death and moved away, leaving Althea to be passed from relative to relative like an unwanted package, resists all these efforts. Determined that her son will never be pushed aside in favor of a new family, she vows never to remarry. In a temper after dealing with her mother-in-law and others advice givers, Althea decides to sell her husband’s hunting dogs as a gesture of independence. Deprived of oxygen at birth when the umbilical cord twisted around his neck, Jesse Best was slow of mind. Known throughout Marrying Stone as Simple Jess, he is both part of the community and set apart from it. Secure in the love his father and his sister Meggie and her husband and daughter have for him, Jess knows that he is a man but one who is different. He longs to be like other men who have hunting dogs, guns, and women. His father has told him that he can never have a woman, but Jess dreams of owning a dog and a gun. When he overhears Althea declare her intention to sell her husband’s hunting dogs, thoughts of buying the dogs fill Jess’s mind. Jess is elated when Althea proposes that he work for her doing the work necessary to prepare for what could be a tough winter in exchange for all four dogs. As Jess works for her, Althea comes to understand that Jess is far more than the simple-minded child she had thought him to be. He is kind, strong, hard-working, and patient with her son, and he has the blond good looks for which the Piggots are known. He is also far more knowledgeable about what needs to be done on the farm than Althea is. For his part, Jess is proud to work for Althea. He takes pleasure in seeing that she and young Paisley have all they need for the winter. And he does appreciate her cooking. However, those who want to see Althea married persist in their efforts. A kangaroo court imperfectly manipulated by Eben gives Althea an ultimatum—choose a husband from the two men (Eben and Oather) who have offered for her by Christmas Day or her family will make the choice for her. But as Christmas draws closer, each day yields new evidence of Jess’s place in Althea’s life and in her heart. I’m a huge Morsi fan whatever the genre in which she writes, but there is something special about her American historicals set in the early decades of the twentieth century. Courting Miss Hattie, Garters, Wild Oats, Something Shady—they all have a place on my keeper shelves, but even among this group of exceptional novels, Simple Jess is a standout and Jesse Best is one of the most extraordinary heroes in romance fiction. Morsi takes a character who would be unusual even in a secondary role (as he is in Marrying Stone, his sister Meggie’s story) and makes him the heart of this book. She reveals the sweetness, the strength, and the wisdom of Simple Jess through the character’s thoughts and actions and through the reactions of others to him. When Eben Baxley meddles in the bargain struck for the dogs and announces that he will wed Althea and Jess will no longer be needed on the farm, Jess understands that Eben is usurping authority, but Jess is unable to process his thoughts quickly and clearly enough to express them. Jesse's mind wouldn't work. It wouldn't order up the terms and phrases in the order needed. The only thoughts that came to him were hurt and angry ones. The only words he could conjure up were no, no, no. And he couldn't just say that. He clamped down his teeth and furrowed his brow trying to force the right words, the real words, the words he wanted to say into his brain. But they would not come. It was one of those times when Jesse hated being simple. It was one of those times when he most wanted to be like other men. It was one of those times when he had to hold his peace because his mind was not their equal. Later, when Althea’s small-minded mother-in-law aims a thinly veiled insult at Jess and the “bad blood” that produced him, Meggie eloquently responds. Although less rare than Jess, Althea is also a richly drawn character. She is very much a woman of her time and place, confronting the restrictions imposed upon her with equal measures of courage and pragmatism. The secondary characters too are developed with a deft and generous hand. Jess’s father, Onery Best, loves his son and has passed on to Jess his own definition of manhood. Granny Piggott is a delight, fully herself and yet clearly in the line of the wise, old hag popular in folklore. Even Eben and Oather are dimensional characters with histories and distinct personalities who act credibly within those contexts. In the tradition of authors who understand the importance of place, Morsi makes Marrying Stone a character as well. My only complaint is that Baby Paisley with his desire to be the man of the house and his slipping off to trail Jess on hunting trips seems incredibly precocious for a three-year-old, but perhaps three-year-olds were more mature a century ago. Like many of my favorite books, this one moves me to laughter and to tears, and these characters earn a cherished place in my memory. 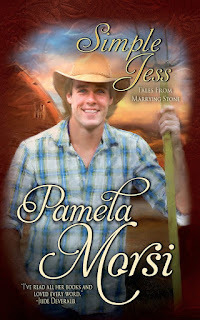 Simple Jess truly is a classic of romance fiction. I give it my full-hearted, flag-waving, balloon-releasing recommendation, and I’m so happy that, thanks to its digital release, it is now easily available to new readers. 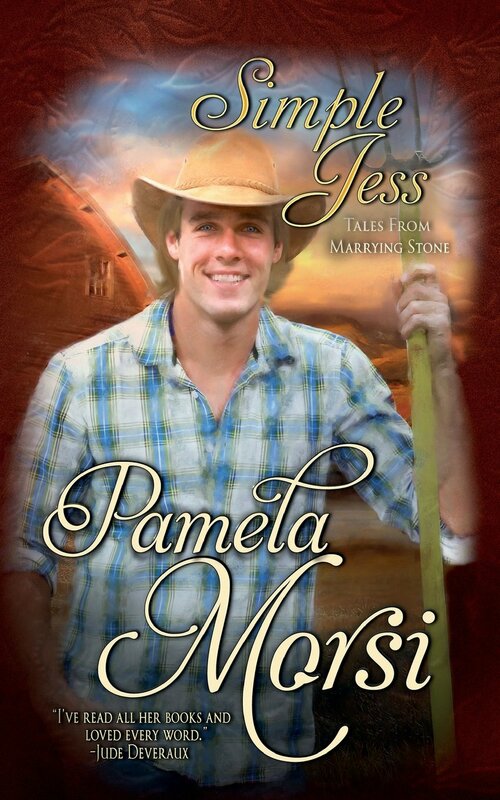 I also recommend the two connected books: Marrying Stone, which precedes Simple Jess, and The Love Sick Cure, which features another Jesse, this one as a heroine who starts out with a broken heart but finds a cure in Marrying Stone. I love that one too, Di. Morsi is one of a very small group of authors who has several books on my all-time top 100 list. You've convinced me, Janga. This is tugging on my heartstrings and I haven't even read it yet. I hope you love it as much as I do, PJ. That is the ultimate compliment - laughter and tears. I know I've really connected with a book when it hits my emotions like that - thanks. Another three books I must read.